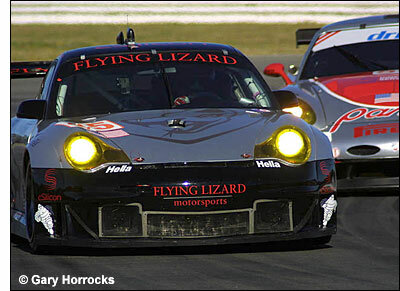 We’ve been trying to pin down Seth Neiman and Lonnie Pechnik regarding their 2006 ALMS plans for a few weeks, but today it’s confirmed - Flying Lizard Motorsports will again field two Porsche 911 GT3-RSRs in the GT2 category. Johannes van Overbeek and Jon Fogarty will again pair up in the team’s #45 Porsche: these two finished third in the GT2 Class in 2005. The #44 Porsche will feature three drivers: Seth Neiman will be paired for four races with his partner from the last two seasons, Lonnie Pechnik, and for four races with Darren Law. All three will drive together at the two longer races (Sebring and Petit Le Mans). Darren Law ran with the Lizards in the #45 car for the full 2004 season and two races in 2005. The significant change is that Stefan Pfeiffer will join the team for the 2006 season, working with Flying Lizard crew chief Tommy Sadler and chief engineer Craig Watkins on the #45 Porsche. Pfeiffer moves to the Lizards after serving as crew chief for the Petersen / White Lightning team for the last two years. “In our first two years of competition, we finished in the top three in the Drivers and Team Championships: second in 2004 and third in 2005,” comments Tommy Sadler. 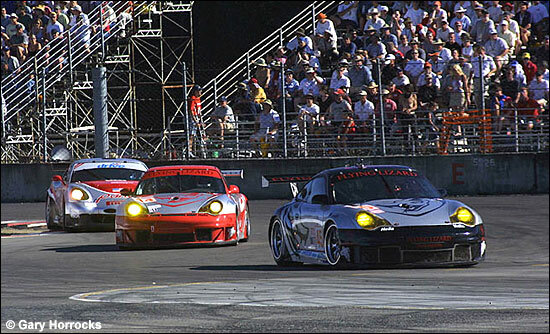 “We will do everything in our power in 2006 to fight for the GT2 championship.